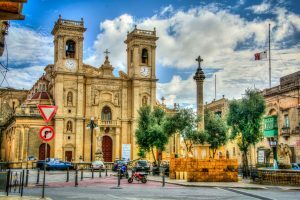 What is the best place to stay in Malta? Which is the best place to stay in Malta? So many opinions and so many answers. It all comes down to what kind of visitor are you? What exactly are you looking for on your trip? are you renting a car or using public transport? Thinking a bit about these question will give you a clearer idea of which area you should be looking at for accommodation. Malta is an island of approximately 450 thousand inhabitants, the island’s area is that of 316 square km. However, being so small doesn’t necessarily have anything to do with what the country has to offer. In fact, people visiting Malta should not underestimate the country, thinking that a weekend would be enough for such a small area. 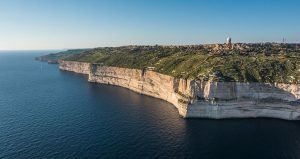 It is a fact that Malta is just a 27km long island, however we still recommend that if you plan to come for a short visit, consider making it at least a 3 day stay in Malta. 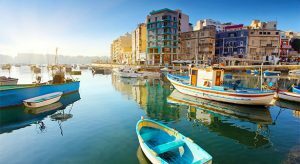 How to choose where to stay in Malta? When choosing your accommodation, it would be wise to keep in mind that you should find a place with a good strategic position. This is because, the bus system in Malta, combined with the traffic on the island could be time quite consuming. In the summer, buses are quite oftenly full and waiting time tends to be long since the population on the Island shoots up to a million inhabitants. Renting a car in Malta is a pretty practical way of travelling around, keep in mind though, that since it was a British Colony, Maltese drive on the left hand side of the road. Another option could be that of renting a scooter, this would be ensuring you a hassle-free holiday, since you would be avoiding all the traffic and the waste of time to find a parking space wherever you go. Consider also to rent a boat in Malta for excursions around the islands. Malta has very beautiful scenarios that you can see only by boat. In case you are not familiar with boats, read here “The definitive guide to yacht charter” and discover which type of boat is more suitable for you. On the contrary of most countries, Malta’s Capital city, Valletta, doesn’t host many tourists. This is due to the size of the city and it being mostly protected by UNESCO, which preserves it from being demolished and rebuilt like most other cities in Malta. Therefore, most of the touristic establishments such as hotels are situated outside of the country’s capital. 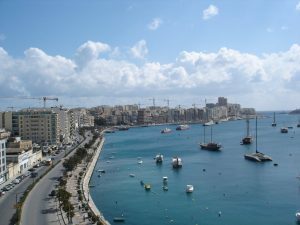 The 3 most touristic cities are St. Julians, Sliema and Gzira. The last 2 are actually a 7 minute Ferry ride from Valletta (Departure from Sliema Ferries), these ferries run every 30 minutes. 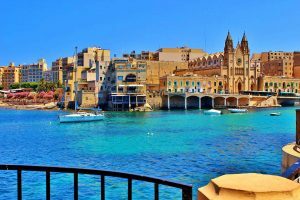 Best place to stay in Malta – Which cities? St. Julians is the most touristic city in Malta. It’s architecture is a mix of newly developed high rise buildings, a 22 storey high tower and the famous harbour of Portomaso with its luxury yachts. However, the other side of it has remained authentic and very local. Many Maltese still live in the old town of St. Julians. Paceville is than the district within St. Julians that is highly concentrated by night clubs, bars, pubs and the new trend of gentlemen clubs. It is the capital of the nightlife in Malta! Therefore, this area is highly requested by young people who are looking for a party holiday. Hence, if you would like to be within walking distance to the clubs but not inside the hectic area of all the clubs, we recommend that you choose St. Julian’s for your holiday accommodation. Sliema has the newest promenade in Malta with the magnificent view of Valletta. Same goes for the part of Gzira that connects to Sliema. 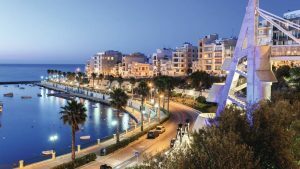 Sliema’s promenade offers a wide range of restaurants, bars and pubs. It is also one of the favourite spots for shopping. 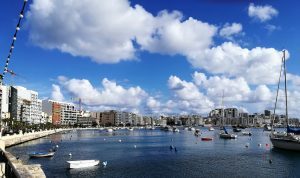 Gzira remained the least developed of the three, therefore, here you will definitely find more locals living and more traditional Maltese houses. Gzira is connected to the beautiful Manoel Island, where Grand Master António Manoel de Vilhena built a fort in the 1720s. People can only enter the Island by walk, it is extremely wonderful to walk around and have a swim or even chill with the lovely view of Valletta! 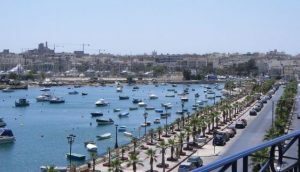 Gzira is a good place to stay near Valletta at reasonable price with wide options of holiday apartments. The north part of the Island is highly recommended for beaches, beautiful sunsets in the summer, more authentic towns and tranquil areas. Many british tourists love this area mainly because of all the pubs and Karaoke bars. If one decides to stay in this area, we would then suggest renting a car or a scooter since buses do not run very late at night. Staying in the north would then be closer to the ferries to both Comino and Gozo. This area is recommended for people who are more into nature, climbing and hiking. Is the most untouched part of Malta. It has beautiful sceneries and very authentic towns. This however, would also require you to rent a car or a scooter if you would like to be mobile since public transport is also a bit restricted. Read also: Top 5 things to know before a holiday in Malta.